Minoxidil is useful in treating patient with hypertension ( anti hypertension) which also involve in treating patient with refractory hypertension. Minoxidil will react by inhibiting and blocking the contraction of the vascular smooth muscle which promote dilation of the arterial smooth muscle. The mechanism of action of minoxidil may include inducing the hyperpolarization of the myocyte through the opening of the potassium channels in the membrane of the smooth muscle. Besides acting as anti hypertensive medication, minoxidil may also be useful in treating patient with baldness problem/ hair loss problem. 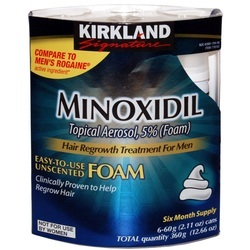 Minoxidil may promote the growth of the hair if minoxidil is used topically. The common side effects of minoxidil is hair growth.